Micro Needling For Hair Growth Does It Work? Is It Effective? How effective is micro needling? What exactly is micro needling and is it good for hair growth? It sounds kind of painful. Don’t worry, the needles are extremely small. Tiny even. Micro-needling is also known as collagen induction therapy. That’s because very small needles are used to stimulate your skin to produce collagen which is one of the building blocks of healthy skin. It can also be used to help with hair loss. The same way it stimulates collagen production it also can heal hair follicles. So this study, in particular, took a look at the difference between using minoxidil alone vs. minoxidil and micro needling together. It found that micro-needling was superior. They used a derma-roller with 1.5 mm length needles and rolled it over the scalp in vertical, horizontal, and diagonal directions until the scalp mild erythema was observed. Erythema being redness of the skin. This was done once a week. After the 6 month period of microneedling they maintained their results. They experienced new hair growth after 8 to 10 sessions. Once again this study used a dermaroller with 1.5 mm needles. They rolled it over the scalp horizontally, vertically, and diagonally until mild erythema was experienced. The procedure lasted 20-25 minutes each time. Needle lengths greater than .5 mm should wait 24 hours before applying any topical treatments. Side effects are typically minor if you follow the rules above. The most common ones are skin irritation and redness. Bleeding is possible with longer needle lengths. If you don’t follow the rules above, infection as well as more serious side effects from topical treatments are possible. That depends on a lot of different factors. It tends to be most effective when combined with other hair growth options like minoxidil and/or finasteride. While micro needling by itself can be effective for hair growth, it’s much more effective when used in combination with minoxidil. Minoxidil is one of the top 2 options available to counter hair loss. The other being Finasteride. Why is it so effective? Because micro needling increases the absorption rate of the minoxidil. However, depending on the needle length, it’s important to wait 24 hours before or after you microneedle to apply minoxidil. I’ll talk more in detail about the needle lengths below. But, if you’re using minoxidil with a longer needle length like 1.5 mm, DO NOT apply minoxidil until 24 hours before or after you micro needle. Any topical treatment should be used at least 24 hours after using longer needle lengths. With .25 mm it’s okay to apply minoxidil immediately. The reason is because the longer needles used the more easily absorbed the solutions are. We don’t want a ton of any treatments going directly into our system. Needle length is very important to how effective micro needling treatment is. Needle lengths can vary anywhere from .25 mm to 1.5 mm. Shorter needle lengths (.25 mm – .5 mm) will help with the absorption of topical treatments like minoxidil to make it more effective. This length typically doesn’t hurt and can be used more often. Longer needle lengths ( .75 mm – 1.5 mm) will help boost collagen production and hair growth. These needle lengths hurt to use but provide more effectiveness. The study I quoted above used 1.5 mm needles. The 1.5 mm may cause you to bleed a little. How painful is microneedling? Find out here! It’s no cause for concern if you do bleed. Just allow your skin time to heal. Although you may bleed a little, the studies that had great success reported no bleeding. Only minor redness of the scalp. The key is to avoid A LOT of bleeding. Let’s talk about the derma-roller first. 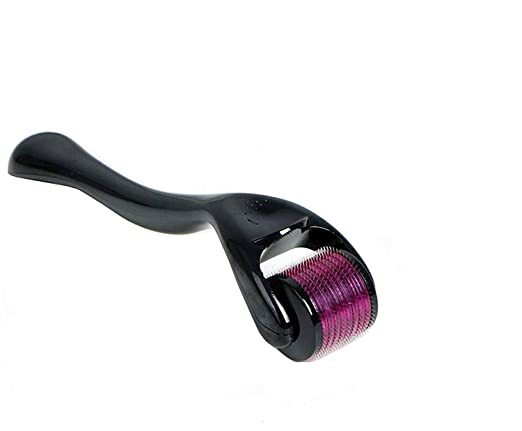 The derma roller is the fastest and easiest to use micro needling tool. It’s simply a roller with needles on it you roll across your head. That said, it is not as effective as the other types. And it’s not recommended for people with a decent amount of hair as it can get caught in the needles more easily than the other tools. The derma-stamp is better for those with longer hair as you don’t roll it, you press it on like a stamp. This takes a little more time to apply to your scalp than the other two options. If you’re looking for an excellent derma-stamp I suggest this one. It’s adjustable so you can change the depth of the needles easily. That’s an invaluable option so if you find your scalp can’t handle a 1.5 mm length, you can easily tone it down. The only issue is that due to the mechanics of the tool, it’s quite difficult to properly clean. The derma-pen is the most effective option. 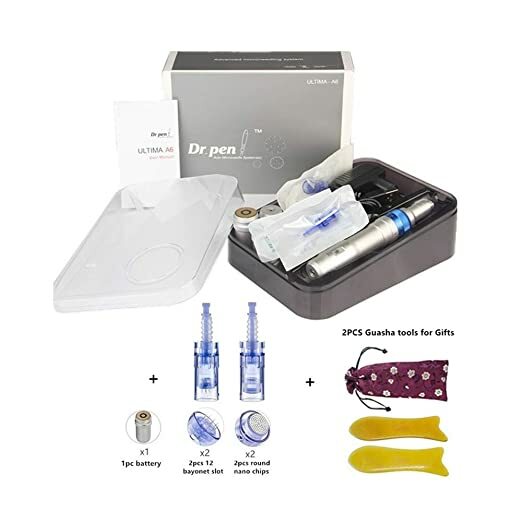 The other two types of tools must be thoroughly sanitized after each use to prevent contamination but, the derma-pen uses replaceable cartridges. Some pens even allow you to adjust the length of the needles. You can also more easily change how many needles are in a cartridge where as you’re stuck with what you have with the other options. It’s easier to judge how far you’ve punctured the skin with a pen vs the roller. It’s difficult to gauge how much pressure you need to use with the roller. The pen you can just make sure it’s making contact with your skin. The needles in the pen move up and down rapidly like a tattoo machine. The downside to the pen is you will need to buy replacement cartridges. And they can be much more expensive than the other options. The quality of the tool is important to prevent any problems with bent needles. There are pros and cons to different kinds of needles. Two of the most popular types are titanium and stainless steel. Titanium needles are much more durable and last longer. Stainless steel needles are much easier to keep clean. So it’s easier to prevent infection. These needles are also much easier to sharpen because stainless steel isn’t as strong as titanium needles. It’s important that you clean your tools before you use them. Use rubbing alcohol to sanitize your stamp or roller before and after use. Just to make sure everything is clean. The upside to the pen is you just throw away the old cartridge and replace it. No cleaning needed. The key is to allow your head to heal afterwards. Longer needle lengths and higher needle counts will require more time to heal. For example, 1.5 mm should only be used once a month or month and a half. .25 mm can be used every other day. That said, those are just guidelines, you may want to experiment to see what your scalp can handle. The study I mentioned above used 1.5 mm needles weekly. Prev How To Get Finasteride Online – Can You Get A Prescription? Next What Is DHT? Is It Responsible For Hair Loss? Can I get rid of it?